As many of you have noticed, I’m posting much more about restorative yoga here on the blog, mostly in an effort to explain what has helped improve my mental and physical health over the last few years. If it inspires you to take a restorative class or pick up a book or just take a break – hooray! Some feedback I’ve gotten as a result has come in the form of questions, so today I offer you some answers to those you might be too embarrassed to ask. Restorative yoga classes are much different from regular classes. The biggest difference is that in restorative yoga we lie down with blankets, bolsters, blocks, straps, sandbags, over chairs and then we lie down some more. In other words, probably the most difficult part of the class is making it there on time. Once you’re there, we just lie down. If you can easily get down on the floor and up again an hour or so later, we’re golden. We get comfy and let the props do the work. Other people may have a more technical explanation, but I feel like lying down with the purpose of relaxing the body and brain is a good way to put it. What if I fall asleep during class? When was the last time you completely relaxed your body and didn’t fall asleep? For most people, it’s been a while. Plus most of us are pretty tired. So, what happens if you fall asleep during class? Well, you may get a little nap in. I’m not going to call attention to you or make you feel like a horrible person or even think badly of you. I’m honestly going to think that you are tired. I bring this up during every class, especially with new people, because I know I’ve felt embarrassed when I’ve fallen asleep in class. I am pretty sure if you are falling asleep, it means you are tired and it’s a good thing you are there taking a break. It happens. Waking yourself up with a snore is usually how you know you were really asleep and not just spacing out thinking about other stuff. Again, this is a pretty good sign you are tired. How do you know so much about this sleeping in yoga business? It used to happen to me ALL.THE.TIME. Dude, sometimes I’d fall asleep in the 5 minute savasana at the end of a regular class. Apparently, I have a long history of being tired. In fact, it still happens to me. Just the other day I was practicing some restorative poses (ok, one pose) at home and I *totally* fell asleep. How do I know I really fell asleep and wasn’t just thinking about other stuff? What if I toot ? Same as snoring. It happens. And then we don’t worry about it because it doesn’t matter. So we’re all lying around over bolsters and propped up with blankets and blocks and then what? What are we D-O-I-N-G? The short answer is we are doing nothing other than taking a little break from the constant go go go. The longer answer is making your body comfortable enough for muscles to be able to really let go and relax and rest. During class I try to keep my talking to a minimum so you have a chance to experience physical relaxation and quiet at the same time. We don’t get to do that every much in our modern constantly connected world. It can sometimes feel like a mini vacation. So, do you have anything you’d like to know about restorative yoga? 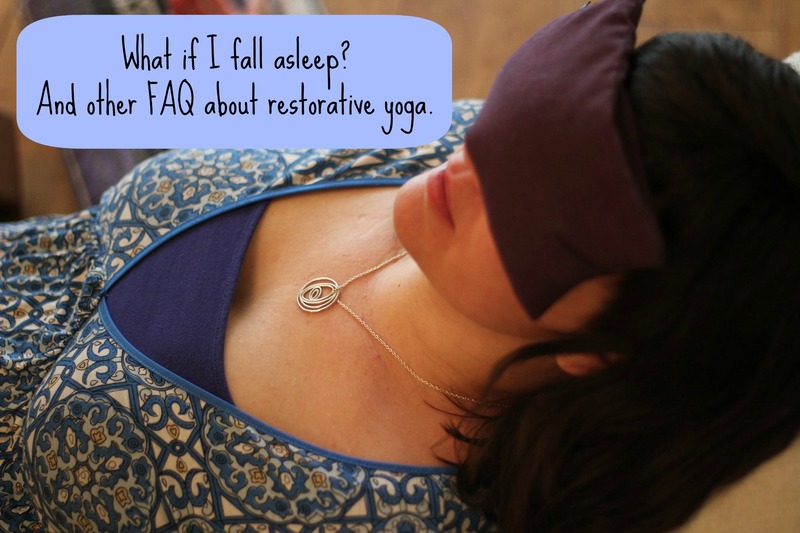 This entry was posted in A Yoga Story and tagged FAQ, It's All Yoga, restorative yoga, Sacramento, what are we doing?, what if i fall asleep?, what if i fart?, what is restorative yoga? by Teacher Goes Back to School. Bookmark the permalink.